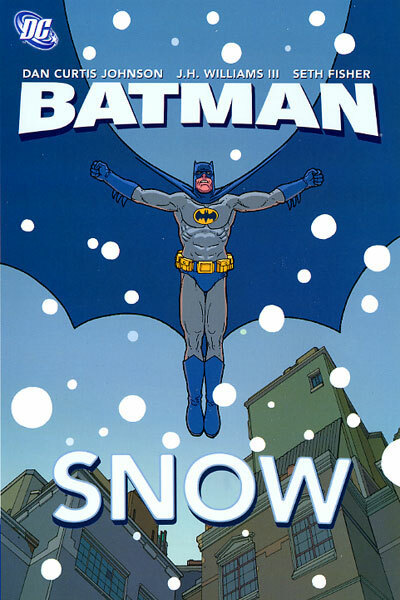 As I’ve mentioned earlier, I picked up Batman: Snow because it is another book drawn by Seth Fisher, but this was almost entirely without the abstract style that I loved so much about Will World and Big in Japan. 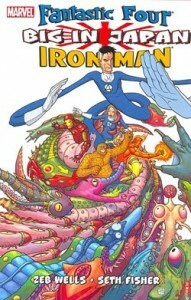 The art is still distinctively Fisher, but without the weirdness, it didn’t feel terribly special to me. There are some images with a lot of detail that I feel are particularly great, but overall the art is just good, but not especially noteworthy. The story telling was pretty straight forward, and it’s a good story, so it was a quick and easy read. This basically just re-tells the Mr Freeze origin story, with some minor details twisted and changed around, and the added dimension of Batman trying to put together a crime fighting “team” of his own. At the end of the book, the team and batman part ways, but there is mention of how some members of the team want to continue working together, just not for batman… I haven’t yet found any reference to what or who they might have become. I noticed that this book isn’t (yet) added to the wikipedia entry on Mr. Freeze, but I’m really too sleepy to do anything about it right now. Overall, this is well worth a read, but I probably wouldn’t go out of my way to find it unless you’re really into Batman or Mr. Freeze. This was absolutely brilliant. I loved how much humor there was in this, both in the artwork (giant monkey peeling a subway car like a banana!?) and in the fabulous writing. The overall plot was totally captivating and hysterical; the premise being that Japan’s giant monster problem has pretty much been eliminated by the proliferation of super heroes in the 20th century, so they’ve created a “Tokyo Giant Monster Museum and Expo Center” to commemorate. The Fantastic Four and Iron Man have been invited to the opening ceremonies, but wouldn’t you know it, their tour is interrupted by… you guessed it! …an attack by more giant monsters! 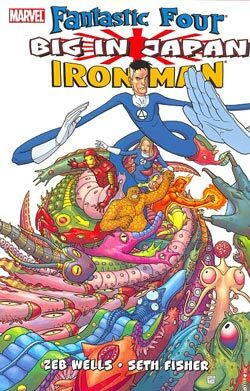 I have one other comic collection drawn by Seth Fisher (Green Lantern: Will World), and Big In Japan has now solidified my love for his cartoony surrealist style. I was extremely saddened to learn in the beginning pages of this comic that he died near the beginning of 2006. Apparently this was the last comic that he worked on. Look for my review of another of Seth Fisher’s creations, Batman: Snow in the near future. I strongly recommend Big In Japan, as it more than transcends its silly superhero origins, and becomes a story of cosmic comic importance. The back of this trade paperback has like fifteen pages of artist notes, and a bunch of sketches and other cool stuff. (Including an entire issue of another Seth Fisher drawn comic called Fanboyz, which is sort of like Jackass meets spider man.) Good stuff.